There comes a time in everyone’s life where we need to reflect. Reflect upon our health, our happiness and our future. That time for me, is now. With Buddy’s recent scare, and he and Ginger’s inevitable aging, I put in motion a set of changes to prolong their time with us and ensure they are as healthy, comfortable and pain-free as possible, for what we hope to be, years to come. In our quest for finding the right mix of potions, we realized that what applies to them could and should, help inform our own regiment. Health and well-being is largely dependent on choices. We make choices everyday and those choices add up to a map of our path that brought us to where we are in life, love, work and health. Some of our health is determined by genetics, but part of our health is dependent on all of the choices that influence each of these areas. I am always amazed at how much we have control of in this seemingly out-of-control world. Simply put, we need to take control of our lives and be informed about as much as we can to make the right choices. Fifteen years ago, I was challenged with an illness that was determined by genetics. I read up on and educated myself at the time, but if faced today with the same situation, I would have gone at it a little differently, and certainly with more vigor; in fact, that is exactly what I am doing now. More vigor, more thought, more awareness. Genetics never change (although, soon they can). Today, I would have looked to nutrition, emotional stability, situational acceptance, the power of the mind, and the power of ancient remedies. I would have meditated, done yoga, accepted my situation in a positive light and sought out things that are not the routine answer. This is not to say that I did not do things right, because I did the best I could with what I knew and discovered at the time. I survived and came out, perhaps, a little bit stronger. It is never too late to start making smarter choices, bigger changes, and positive impacts. One of the first things to do is to make the choice to become better educated on your options for healthy living. The next step is to make a commitment to implementing those things you learn. Then, obviously, you need to take action. This is obviously easier said than done. I am, in some capacity, working in all three stages. I was especially happy to find that in the, “becoming better educated” stage, that I have more excuses than ever to seek out, cook and eat wild mushrooms. Oh, how I love wild mushrooms! Turns out they are good for us (much to his chagrin). I recently discovered that mushrooms present significant health benefits. So significant in fact, that even Tom can’t ignore. A friend of ours turned us onto the magic of mushrooms. No, not that kind of mushroom (shame on you). Our friend had become ill, lethargic and un-diagnosed. It was not until she began taking these supplements that she was able to resume her life after years of a serious detour. I had already read a little bit about how mushrooms might be a good thing to incorporate into Buddy’s diet when we thought cancer was lurking within. I became more intrigued after hearing about Heather’s story, and even more intrigued when I began reading up on the supporting research. Not only are certain varieties believed to have properties that reduce blood pressure, help control diabetes, sharpen memory and strengthen immunity, the largest benefit, in context of ourselves, is inhibiting growth of cancer cells. As with most things, ingesting beneficial foods are usually not effective in delivering the potency required to reward you with maximum benefit; capsules or extracts are best suited for that. It seems though, that eating mushrooms, of any variety, will offer enough of a reward that I can optimistically recommend they find their way to your plate as often as possible. I am certainly not an expert on the subject and certainly won’t pretend to be in this post, so to read for yourself, take a look here, here and here. I have ordered several products from this site both for Tom and I, as well as for Buddy, Ginger and Dad (read up on Paul Stamets, renowned mycology expert). They have not yet taken residence at my doorstep so I will have to report back in a later post after my real research kicks into place. I will say though, Buddy and Ginger have been religiously taking this (human-grade, made for pets) product for several months now, switching between the joint formula and digestive formula. This, in conjunction to other dietary improvements have made a remarkable difference to their health in this relatively short time. As an bonus, acupuncture for Buddy has proven to provide noticeable relief from a myriad of symptoms. Tom (inspired by Buddy’s unbiased success) has recently joined that club too (and I will talk further on this subject in a subsequent post). As another thought for cure, and intended to help inform my cousin Bridget, epilepsy in dogs also benefits from acupuncture. Eric, go with this, it is a small price to pay for a drug-fee loved one and might prove to be a smaller expense long-term. Read further here for some great thoughts on the subject (Scott and Christine, you will be interested in this too). So if anyone else is also thinking about improving their health, even the tiniest thing can make a difference. Smile more, frown less (I need to do this). Eat 1/2 instead of the whole (Tom needs to do this). Laugh when you feel like crying. Kiss your dog. Kiss your other dog (even if its just your better half). Appreciate what you have and forgive yourself for what you don’t. Eat your mushrooms. Love your life! Mushrooms are lovely cooked in butter and olive oil. However, in keeping it healthy (and shareable with my pups), I am roasting the mushrooms and corn with only the tiniest bit of oil, no salt. You can serve this by itself as a vegetarian dish, or as I did, serve as an accompaniment to beef braised in tangy peach sauce (recipe follows). Gently wipe any dirt or grit from the mushrooms. Remove the stems from the crimini and portabella (if using). If using chanterelles, scrape the stems with a pairing knife to remove the grit then trim the bottom of the stem. Put the mushrooms onto a baking dish lined with foil, and toss with the smallest amount of olive oil needed to lightly coat them; this could be just 1 teaspoon. Set the corn alongside on the same pan. Roast them in a preheated 400-degree oven for 15-20 minutes. Check on them after 10 minutes to be sure they are not drying out. Give them a little stir to mix them with the juices that should be starting to release. If they seem too dry, close them up in the foil for a few minutes. Pull the corn from the oven if the kernels are tender and cooked at this time. The mushrooms are done when they are tender and browned. The trumpet mushrooms will take a bit longer than other varieties. Heat a little olive oil in a pan. Add a knob of butter and let it melt before adding the mushrooms. Cook for several minutes, stirring a few times, until the juices begin to release. Sprinkle a pinch of salt over and grind in some pepper. Add the garlic and continue cooking until the liquid evaporates. The whole thing will take about 10-15 minutes. Lay down a few slices tomato on each plate and scatter the corn. Divide the mushrooms, selecting a mix of the varieties for each plate. Add in the peach slices and sprinkle with a little salt. A few drops of truffle oil are a nice addition if you feel so inclined. This braised beef, as well as the sauce, is delicious over the mushroom and corn ragout. You can roast the mushrooms and corn at the beginning of the braising time since the oven begins at 400-degrees. The oven will then get turned down for the remainder of the braise, at which time the mushrooms and corn can be set aside and heated-through later. The sauce will make approximately 3 cups, but for this you will only need 1 cup, so you will have extra to freeze or bottle for later use. Line a baking dish (large enough to hold the ribs) with foil. The foil should be large enough to fold over and cover the ribs. Place the slices of onions onto the foil and set aside. Preheat the oven to 400-degrees. Season the beef with salt and pepper, then dredge through the flour. Heat a sauté pan and add enough oil to just coat the bottom of the pan. Brown all sides of the beef; be sure to let it sit undisturbed until one side is brown before moving. When it is ready to be turned, it should easily come away from the pan without sticking. When all sides of the beef ribs are browned, transfer to the baking dish, setting the ribs over the onions. Deglaze the sauté pan with red wine and scrape all the bits up to pour over the ribs. Pour the peach sauce over the ribs and cook uncovered for 45 minutes. Baste the ribs with the sauce and cover with the foil. Continue cooking until they are tender, basting occasionally, approximately 1 1/2 to 2 more hours. During that time, if the pan gets too dry, you can add a little water. The onions will be caramelized and taste delicious served under or alongside the beef. You can use the pan sauce after removing the fat, or as I did, use some of the tangy peach sauce that was not used for cooking. My dear sister-in-law Laura, our heart goes out to you and our/your beautiful, sweet Amber. She will always be by your side and in all our hearts. I love you Mom; I’ll meet you at the other side. I never knew mushrooms had so many benefits! What a fantastic write up. Thank you, I didn’t either until I began exploring holistic remedies. It is a bonus that they are so delish ! Thank you for your very thoughtful insights on life and on mushrooms. When I was a child my parents would take me along when they foraged for mushrooms. My grandfather Hudak would also go out and pick them and my grandmother would thread them on string and hang them behind the kitchen coal stove to dry. The dried ones would be reconstituted for holiday meals. The tribute to Granddog, Amber, was touching and so caring. Thank you from all of us. I would love to learn to forage mushrooms someday; what a delightful memory. The old fashioned methods are sometimes overlooked yet so obvious. Eat those mushrooms, any way you can. Amber was a sweet soul and will be missed. Great information Stacey, it’s always good to try to do everything we can to improve the health and prolong quality life both in ourselves and our fur friends. I love mushrooms, don’t forage for them but have access to all manner from the store. The recipe sounds delicious and I think my pups would love some mushrooms in their diet. I am so sorry for your sister in laws loss of her sweet Amber. My heart goes out to her and her family. I think you might want to give the mushroom powder a try to see if it can help with the diabetes for Nando and Izzy. My Dad has diabetes and I am sending him some if the supplements. Thank you for your kindness; Amber will always be with Laura but it is such a difficult loss. I love reading your posts! I am going to eat more mushrooms- Joe and the boys are not fans so I have not included them in our diets- but plan to make the change. Hope all is well! I always love to see you are reading and enjoy your comments too. Tom is not the biggest mushroom fan but has come around to the wild ones and I can also sneak them into a meal without his knowing. The supplements are easy as taking a vitamin so that will become a new part of our daily routine. Look forward to seeing you and Joe in the Spring. Very interesting post. Really hope that Buddy’s on the mend… And Amber looks like she was an absolute angel. Thanks, Buddy seems to be getting healthy and inspiring us too. Amber will be missed, appreciate your thoughts. I’m a ‘shroom lover but had no idea they came with so many health benefits. 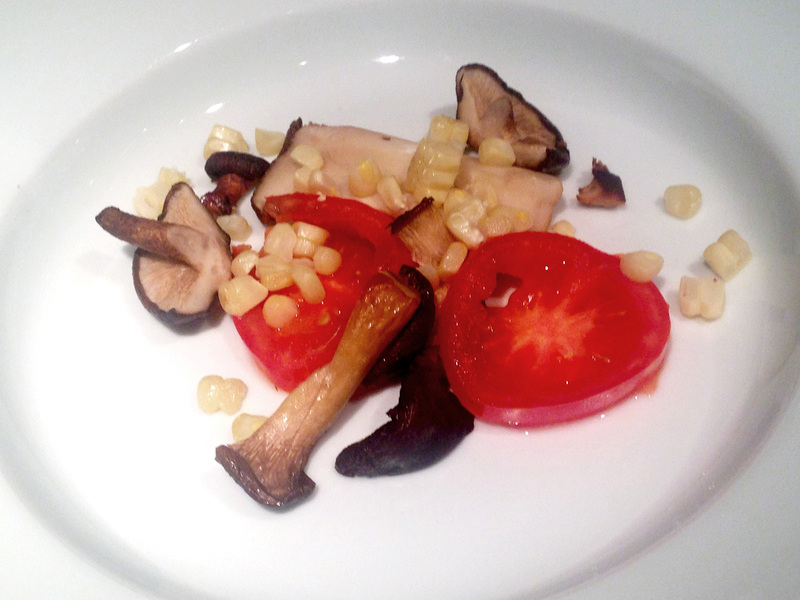 This post was an eye opener, as was the idea of combining mushrooms with peaches and corn. With condolences to Laura. I’m sure Amber was very lucky to have been a part of her household. Love Buddy! (and Ginger too, of course, of course.) So interesting to learn more about mushrooms! I love them, so I think I’ll do MORE with them! This sounds wonderful, with such a great combination of flavors! Yes, kissing our dogs is fantastic for our health!